I like the part when you said, "Lets hack the Bank of World".. That's awesome. 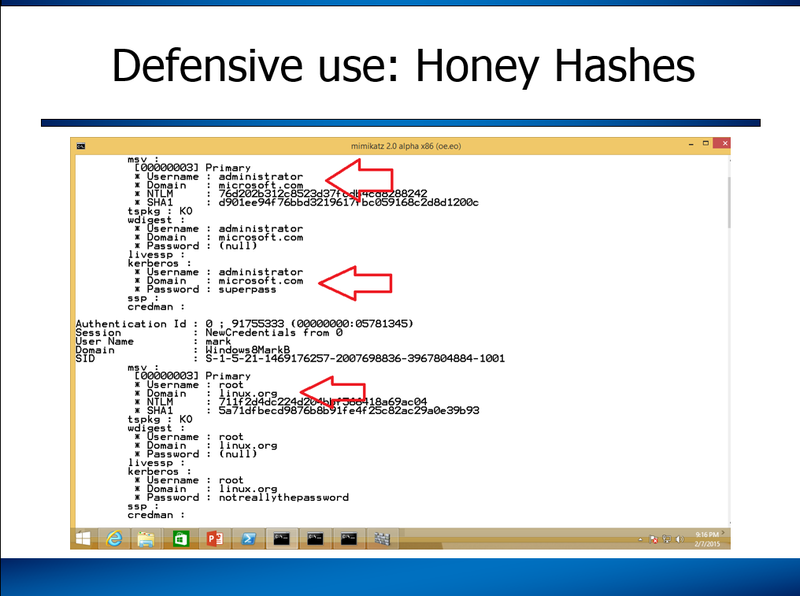 Are you honey hashing me? I think this guy is honey hashing me. Mark you should register a trademark for "honey hash" immediately! I am curious on how long these stay in memory. Until reboot or ...? I choose ipconfig instead of cmd.exe just so the cmd.exe process isn't left running. Assuming a host is compromised by an attacker, the attacker could check the login scripts and see this is being run at login. He may or may not understand the purpose. If he understands the purpose, then he may be more cautious with post exploitation. If he doesn't understand the purpose, then he is likely going to try using the user name and password. Event ID 4625 is logged in the Security event log when a login fails. You can specify a scheduled task to run a PowerShell script when this event is fired to check if the attempt was for the Super.Admin account. The script could then send an email notification (and/or syslog message) if the attempt was for the Super.Admin account. Both the script and the scheduled task can be deployed with Group Policy. I can post an example script if anybody us interested. So I take it nobody watched the video? He says the hash is dumped from memory as soon as the CMD process exits. You have to leave it running, an ephemeral process won't work. Did you test this and confirm it works? If so, given that the credentials only stay as long as the process is running, can you explain how it works, since I'd think that the credentials would leave lsass as soon as ipconfig finished. Also, in my testing, this doesn't work for getting the password in. If I run the runas manually, I can see the password with mimikatz as long as I have the cmd window open. But if I try to pipe the password in, mimikatz shows the user but with a blank password. I changed my script to run cmd.exe instead of ipconfig.